Really? Google Arts and Culture? Really? Said far too many strangers to my brothers and me when I was a little girl. Which was flattering, especially since I had pierced ears. In my defense I also had a tragic mushroom-cut and an outgoing nature to boot. I was the loud Richardson boy. Eventually my passion for collecting frogs in the Summer was replaced with a collection of tiny metal Lip Smacker tins and tickle deodorant in the iconic domed polka-dot silo of a container. I did not know who shot J.R. but I used weekly Dallas T.V. Shows as a tutorial in proper hair feathering. The pack of girls with whom I grew up were not super girly either with the exception of Christie the ballerina. The rest of us played with Breyer Horses instead of Barbies. We would literally invent plot lines with toy horses to rival the twists and turns of any General Hospital episode. I took pictures of my horses with my pink Kodak camera and always ran out of flash bulbs before I ran out of film. It was an amazing treat to have my own camera and a painful exercise for my Mother to pay for the off-center, overexposed 3 x 5 inch clustershots. A tiny kiosk to the West of Foodarama Grocery was the collection point of film and once that film was developed, days later, a rat hole to toss hard-earned money down into. Unfortunately there was no prior knowledge that your photograph would be crap. 2018? Well, that’s a different story. With my endless storage of photographs which I see instantly and do not have to pay for, I may over-document a tiny amount, perhaps. I am most happy behind the lens taking pictures of others. When not taking wide-mouthed selfies. 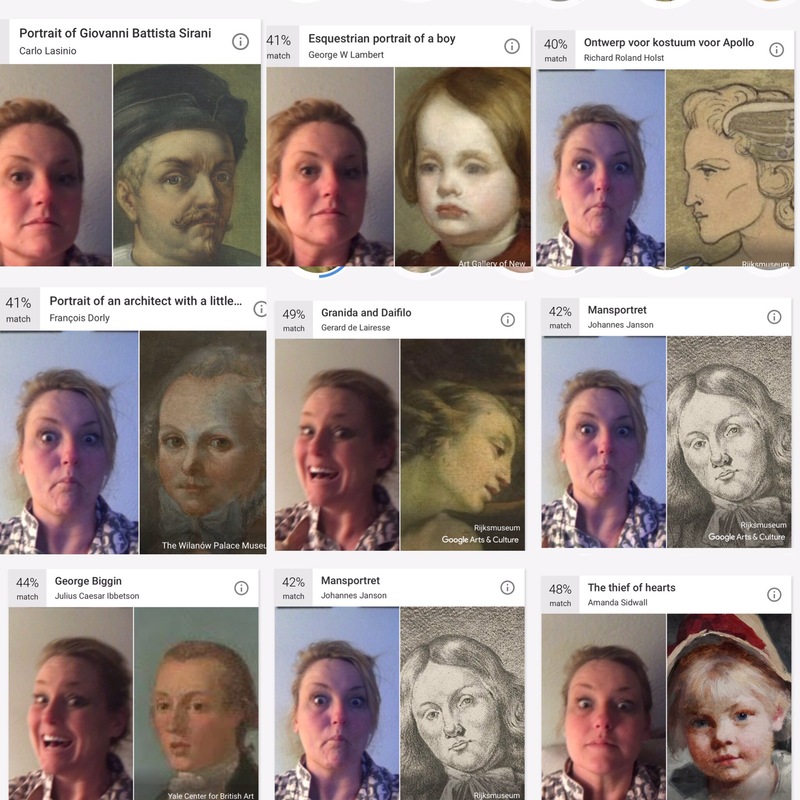 So when Jack told me about Google’s Arts and Culture App which, among thousands of other useful aspects has the “Is Your Portrait in a Museum?” Activity, I was curious. He said he’d take my picture and instantly see which historical painting subject my face resembled. I was down. Jack snapped my face. Then waited a beat. Then began laughing from his gut’s gut. This app brought me right back to 1978’s King Super Drug in Maplewood Square with my two brothers. The historical figures my face most closely resembled were all DUDES. Every single one. Albeit, handsome men but seriously that brought my room down a notch. Sensing my shock, Jack decided to try again. I made a completely different face and to my relief neither George Washington nor George Washington Carver was my match this time but completely different men. Hair up? Guys. Hair down? Male. Silly face? Testosterone. Straight face? Mister. I encourage everyone to give it a try. Show me what you find! Next postWhy is Podnas BBQ Dealing in The Soy Game? Fotomat! Mr. King! Along with another of your wonderful stories, thanks for the memories!